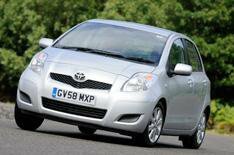 Toyota Yaris | What Car? Disproving the theory that all superminis are much of a muchness from a mechanical perspective is the Toyota Yaris. It's the only car here with a six-speed manual gearbox and an engine stop-start system; and if you question the benefits of either, a few figures should help. It averages 55.4mpg and its CO2 emissions are rated at just 120g/km, which means you'll pay only 35 road tax. Chuck in a list price of 11,515 (easily discounted by 1100) and the potential to retain 42% of its original asking price after three years, and it's enough to put a smile on the face of a miser. The stop-start system demands no contortions or feats of memory just put the car into neutral with your foot off the clutch when you pull up at the lights and the 99bhp 1.33-litre engine cuts out. Dip the clutch and it coughs politely back into life. The Yaris is different in other ways, too, focusing on delivering practicality without spreading its size into the neighbouring postal area, unlike some. It's less than 3.8 metres long, yet only fractionally taller than the loftiest of the rest (the Jazz) to compensate. Instead, it gets its internal space by having two sliding rear seat sections that allow passenger and luggage space to be varied minutely. The only drawback is that, to create any worthwhile rear legroom, the seats have to be so far back that the boot is hardly worth mentioning. The Yaris has the best selection of in-car storage spaces, too. In keeping with Toyota's we'll-do-it-our-own-way approach, though, its digital instrument pod is in the centre of the dashboard and there's a lidded box above the steering wheel. Wrong way round, surely? Sadly, that's as far as the fun and games go. Toyota appears to be unconcerned about letting the driver derive some enjoyment. The Yaris is a joyless thing to drive, so utterly ordinary (at best) as to leave you lost for words. At least it has the light and simple controls typical of a Toyota, and that will probably be enough to satisfy most owners. It's a shame, though. There's potentially a really clever car here, but Toyota has fluffed the chance.